There are a number of childhood developmental milestones to keep watch for as the infant grows like physical developments - head circumference, height, weight and cognitive and motor skills. A child should however have regular, well-baby check-ups with a pediatrician, until required. 1. Head and chest circumference become basically equal to the part of the abdomen. 3. Tries to grasp with entire hand; strength insufficient to hold items. 4. Movements are large and jerky. 5. True eye color gets established as it ages. Cries with tears. 6. Teeth may begin to appear, with upper and lower incisors coming in first. Gums may become red and swollen, accompanied by increased drooling, chewing, biting, and mouthing of objects. 7. Tries to sit alone without support, holding head erect, back straightened, and arms propped forward for support. 8. Environmental conditions, activity, clothing still affect variations in body temperature. 9. Responds to hearing test. 10. Transfers objects from one hand to the other; grasps object using entire hand. Puts everything in mouth. 11. It can see distant objects (4 to 6 m or 13 to 20 ft away) and points at them. As it ages it can distinguish the objects clearly. 12. Watches people, objects, and activities in the immediate environment. 13. Releases objects by dropping or throwing; cannot intentionally put an object down. 19. Lifts head when placed on back. 20. Pulls self to standing position. 21. Says mama and dada, using terms appropriately. 22. Understands "NO" and will stop activity in response. 23. Walks while holding on to furniture or other support and finally walks without support. 24. Imitates activities like playing drum, making actions etc. If there is delay in developmental delay, parents should try feeding the child on demand. Increase the amount of food offered to the child. Offer nutritional, high-calorie foods. If you think developmental delays or emotional issues may be contributing to a child's delayed growth or any of the other factors like genetic, disease etc as mentioned above contact your Pediatrician and take your child for regular health checkups. It is important to understand that there is wide variation in terms of what is considered "normal," driven by a wide variety of genetic, cognitive, physical, family, cultural, nutritional, educational, and environmental factors. 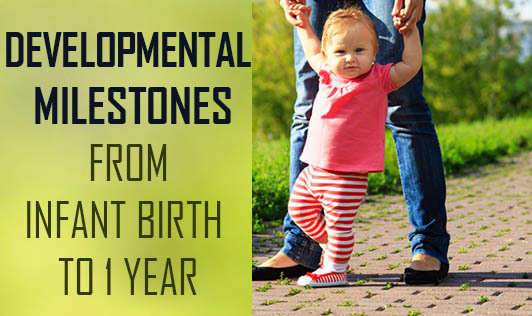 Many children will reach some or most of these milestones at different ages.